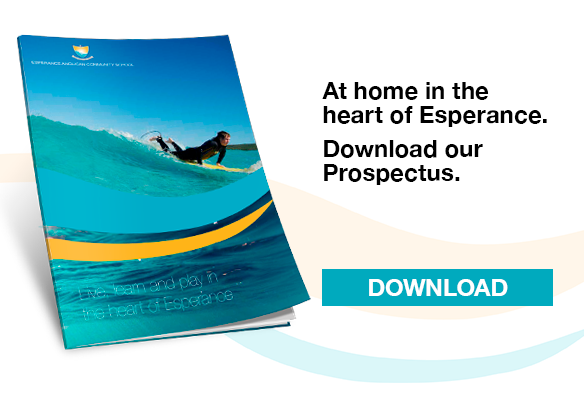 Why Esperance Anglican Community School? Choosing the right school for your child is one of the most difficult decisions you will make as a parent. At EACS, we provide an education that inspires students to reach their full academic potential. It’s a responsibility we take very seriously. To learn more about EACS and how we empower students to discover their passions and God-given talents, Download our Prospectus. Students are challenged to develop a strong sense of belonging, confidence, interdependence and faith. Our strong Christian foundations provide the framework for students to develop as responsible, contributing global citizens. EACS is like a small country town. Everyone knows your name, every person is valued and we all share a sense of belonging. We promote high expectations and equally high standards of behavior. Every student is given the opportunity to explore their strengths and interests through participation in a wide range of activities.